Taxonomical Conservation State: Azorean endemic sub-species. Size: Length between 46 and 58cm and wingspan between 110 and 132cm. Description: Relatively common. Breeds in forest or small woods with access to farmland, meadows and moors. Feeds on rats, small birds, rabbits, reptiles, amphibians, insects and earthworms. Nests in trees. (males) The wings are long with larger "hand" and a shorter tail. Voice: Extremely vocal for a bird of prey. The principal calling is a loud "piiiyay". The call for food by chicks is similar but longer, tremulous and more whining in tone. Taxonomical Conservation State: Azorean and Madeiran endemic sub-species. Size: Length between 30 and 35cm and a wingspan between 62 and 68cm. Description: Breeds in caves on steep cliffs mainly close to the coast but also on the mountain. Both sexes are identical. Voice: The coo is identical to that of the domestic pigeons: a tearful and plaintive "druoo-u", repeated several times with a slight increase in volume. Size: Length between 38 and 48cm and a wingspan between 68 and 77cm. Description: Breeds in forests, parks and gardens even in the middle of cities. Forages for food in fields and pastures. The nest consists of a simple platform made of twigs located in trees. Both sexes are identical. Voice: The sound emitted by beating the wings one with another on take-off is used as an alarm call. During the breeding season, it emits a resonant and rough sound, "hooh-hrooo…" The song consists of a resonant five-syllable - "dooh-doo, daaw-daaw…doo" with the sentence repeated from 3 to 5 times without stopping. Size: Length between 17 and 20cm. 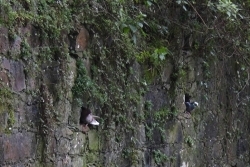 Description: Nests in rock cavities or stone bridges, water mills etc. (males) Black crown, pure white eye-stripe and submoustachial-stripe, other lower parts in yellow. (females) White throat or in darkish grey tones, sometimes more similar to the male, (which is black),white yellowish, eye-stripe white yellowish and indistinct submoustachial-stripe. Voice: The calling is a high-pitched "zi-zi". The alarm calling is a "süiht" repeated and often interspersed with the call. The song consists of a short mechanical series of high pitched notes "ziss-ziss-ziss-ziss", generally mixed up with the alternative higher "si si si siü". Size: Length between 12 ½ and 14cm. Description: Breeds in woodland, gardens, parks and forest margins, generally with some dense vegetation and open areas. It feeds on insects, snails and earthworms. It nests in hollow tree trunks, banks and crevices. Both sexes are identical. Voice: The call is a short and hard "tick" The alarm call consists of a very slight, high pitched and guttural "tsiiih". The song starts with some high pitched notes, after which the sound decreases in tone and accelerates, composed of rapid trembling, excited clean and strident notes; the tempo and the volume are variable not having two equal lines. Size: Length between 23 ½ and 29cm. Description: Breeds commonly in forests, parks and gardens. 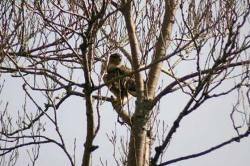 It sings posed on roofs or television aerials, but also in the top of trees and bushes. It feeds on earthworms, insects, and berries. 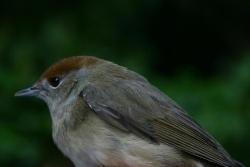 (females) Dusky-brown plumage with a white-brownish throat slightly paler, diffuse dotted breast, and dark beak. (males) Black plumage in spring and summer, yellow beak, and narrow orbital ring. The juvenile is similar to the female. 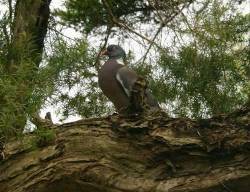 The pale dots in the plumage are lost at the end of the summer and the beak becomes darker. Voice: The call consists of a click -"tesk". When alarmed this is repeated in a long series of -"tesk-tesk-tesk-…" inserted with extended and harsh "screach". The song is melodic with a mellow tone and clear and loud fluting. Size: Length between 8 ½ and 9 ½cm. 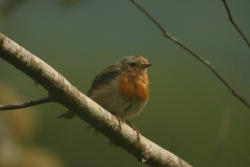 Description: Of minute size, the smallest species of bird in Europe. Breeds in native and Cryptomeria japonica forest. In the woodlands it flutters ceaselessly around the treetops. Confidant, it is not difficult to approach. (males) Crown stripe mainly orange mixed with yellow, largely hidden when the bird is relaxed but which turns very visible when in display or when the feathers are fluffed up. Females usually do not have orange colour in the crown stripe although some may have it in minimal quantities, although it is not normally visible in the field. Voice: The most common call consists of a delicate, high and flutish, "zree-zree-zree". 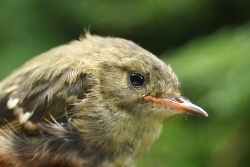 The song is a rhythmic and high "piteetilü", that repeats ending up in a warble similar to that of the Treecreeper (Certhia familiaris) -"zezesuzreeo". Size: Length between 13 ½ and 15cm. Description: Breeds in shady forest with a dense understorey, and in parks and gardens with rank undergrowth. Nests near the base of bushes. Males have a black crown that in the females is reddish-brown. Voice: The call consists of a click -"tesk". When alarmed this is repeated in a long series of -"tesk-tesk-tesk-…" occasionally with extended and harsh "schrech" notes interposed. The song is very melodic, occasionally beginning with an irresolute chattering, and then developing into clear, slightly melancholy flute-like notes at the end. Like other Sylvia warblers it can occasionally produce a prolonged sub-song of mimicry and squeaky rasping sounds. Size: Length between 14 and 16cm. Description: Breeds in all kinds of forest, parks and gardens. Prefers more open forests than dense ones and feeds generally on the ground. Builds a well organised nest in the bifurcation of tree branches camouflaged by lichens and mosses ♂ Red head sides and breast, bluish-grey crown and nape; reddish-brown mantle. Females upper parts greyish-green with light brown blends and under parts greyish-white, wing stripes narrower than in the males. 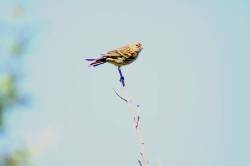 Voice: When perched it emits a lively and high "fink! ", when flying it emits a discrete "yupp".. When it is very agitated it emits a high, delicate and flutish "ziih" Fledged young beg for food with a loud "chirp". The song is very characteristic, relatively constant and tirelessly repeated ending up in a "zitt-zitt-zitt-zitt-sett-sett-sett-chatt-chiteriidia". Size: Length between 12 and 13 ½ cm. Description: Breeds in mixed forest and deciduous trees in low altitudes, in pinewoods, orchards, and gardens. Nests in tree tops, usually in the more external and narrower branches. Both sexes are identical. Voice: Very characteristic call consisting of a trisyllabic and lively "tickelitt"; when the flocks are feeding they emit a monosyllabic "litt" or a disyllabic "telitt" in a tone of conversation. 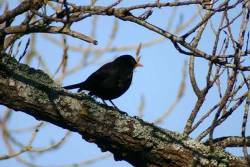 The song is rather quiet consisting of rapid warbles, mewing notes and twittering sequences but always recognised by interwoven call-note or long series of "telitt-telitt-telitt". Taxonomical Conservation State: Azorean, Madeiran and Canarian endemic species. Size: Length between 12 ½ and 13 ½ cm. Description: Original form of the domestic canary. Breeds in Madeira, Azores and Canary Islands, in orchards, forests, bushes, hedgerows, etc, from sea level up to 1500m. It is resident, social and restless. It nests in dense bushes and trees. 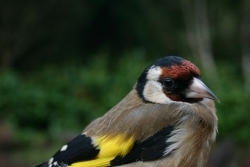 Males forehead, nape and neck markings, throat, breast and flank greenish-yellow, head sides and crown in a blurred grey; under part of sides are light yellow with stripes. 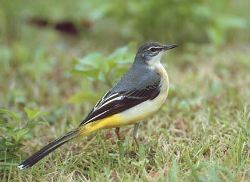 (Females) Duller and less extension of yellow; light and indistinct flank. Voice: The call consists of a "ti-ti-türr" slightly descending and tremulous with an out of tune tone. 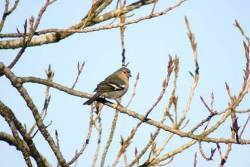 Also emits a "juit" in an upslurred tone similar to that of Greenfinch. It includes discordant and nasal notes quick twitters, muffled trills and many high notes.